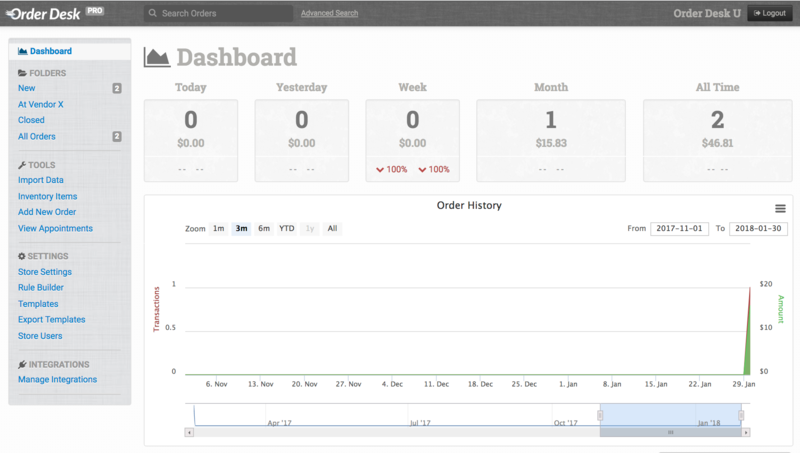 You can add additional users to your Order Desk stores. This can be useful if you have employees or vendors who may need access to order information in your store. Because you may not want your store users to see all of the details available in your account, we have provided a few permissions options as well as the ability to use custom CSS for further modification of the views and access each of your store users has. User accounts are based on email, not store. If you need to add a user to more than one store on your account, add them to each store separately. This allows you to control which stores your users have access to, and they can access other stores not on your account if necessary. To add a new store user, click on Store Users under Settings in the left sidebar. Under Add Store User, enter the email address for the person you want to give access to your store. Click Continue. Add the user's name and make sure their email address is accurate as this will be their login. A temporary password is supplied, as is the option to Send Email With Temporary Password. 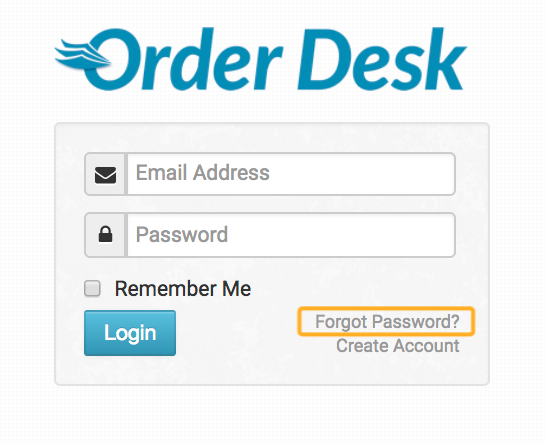 Keep this option selected if you want Order Desk to email the temporary password to your new store user, or uncheck it if you want to provide the password to them another way. When they first login, they will be prompted to change their password. They can also update their user details, see what stores they have access to and set up Two-Factor Authentication (2FA). If the email address wasn't right, you can remove it from your store and add the correct email address as a new user instead. 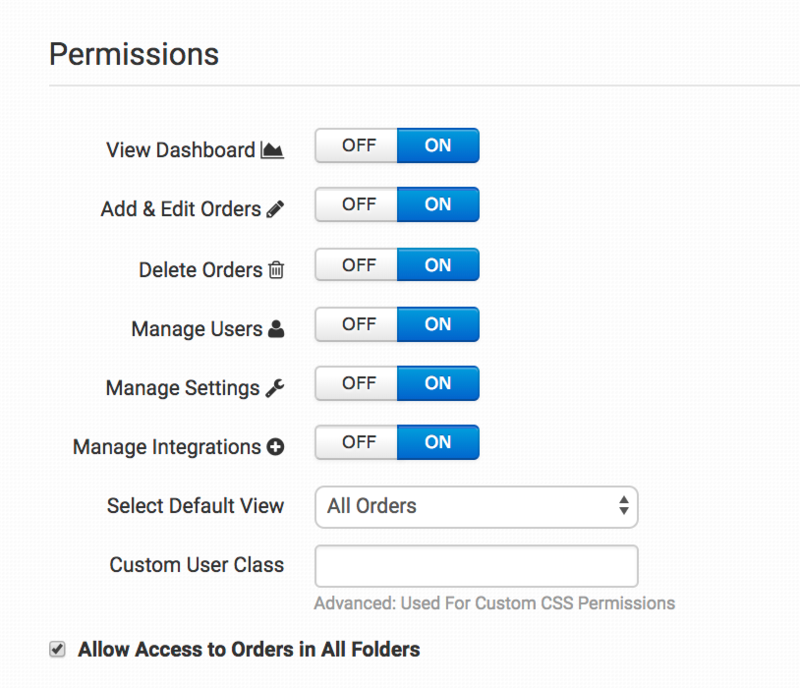 You can edit the permissions you want to give this user from the Add User To Store page in the previous step, or if you ever need to come back in and adjust them, click on Edit Permissions to the right the user on your Store Users page. All permissions are set to ON by default. 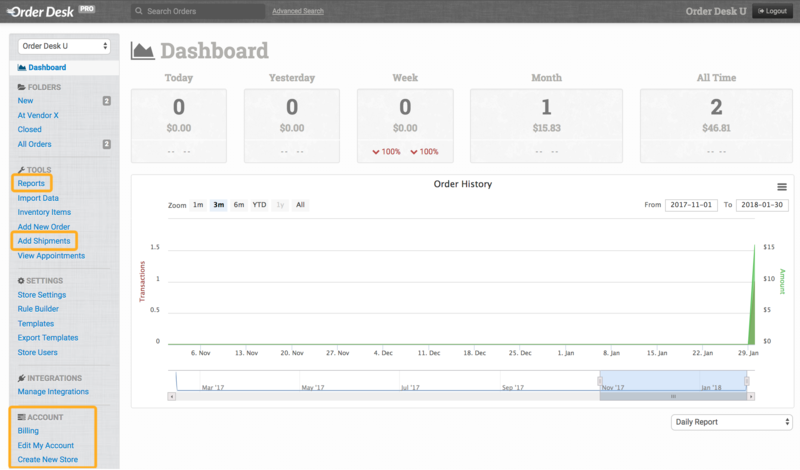 If you are giving a vendor access to your account, you may want to set View Dashboard, Delete Orders, Manage Users, Manage Settings and Manage Integrations to OFF. With these permissions, they will only able to edit orders in your store. If you want even more control over the views and access your store users have, you can use custom CSS. To do this, name the Custom User Class for each store user. In this example, we'll use "vendor" as the custom user class. 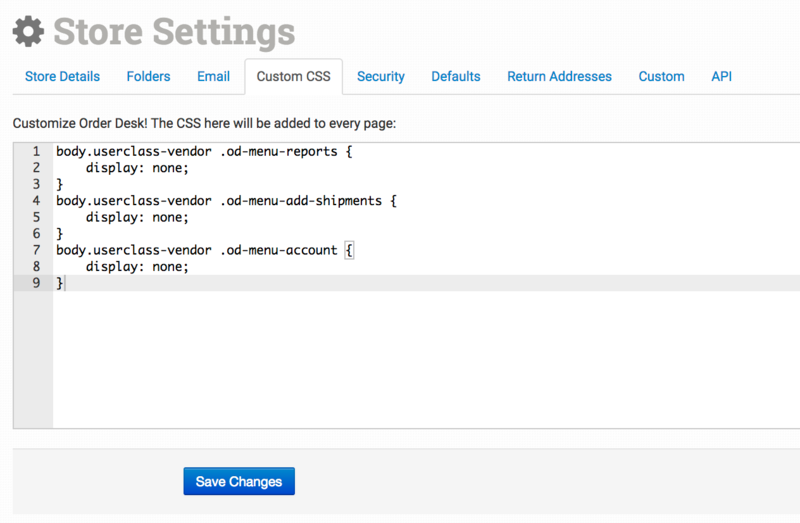 To add your custom CSS, navigate to your Store Settings page and click on the Custom CSS tab. 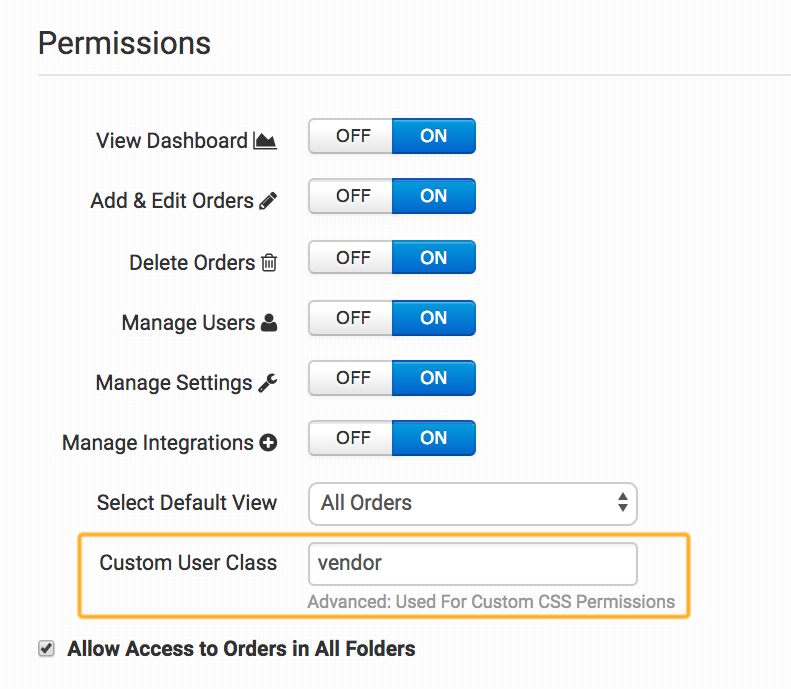 You can now edit the views of users where "vendor" is the custom user class set in their permissions. Please be aware that using CSS to hide certain links from view is doing just that—hiding the link. The hidden pages are still accessible to the user if they know where to find the source code of the app. Regular user permissions do fully remove access to certain areas of the app for specified users. Due to the complex nature of code, you will need to work with a skilled designer or developer for assistance with your custom CSS. We appreciate your understanding that our support resources are reserved for customers with questions about the app and their accounts.